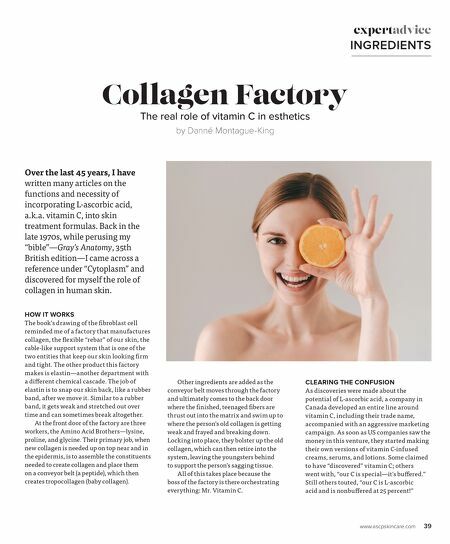 www.ascpskincare.com 39 Collagen Factory The real role of vitamin C in esthetics by Danné Montague-King Over the last 45 years, I have written many articles on the functions and necessity of incorporating L-ascorbic acid, a.k.a. vitamin C, into skin treatment formulas. Back in the late 1970s, while perusing my "bible"—Gray's Anatomy, 35th British edition—I came across a reference under "Cytoplasm" and discovered for myself the role of collagen in human skin. HOW IT WORKS The book's drawing of the fi broblast cell reminded me of a factory that manufactures collagen, the fl exible "rebar" of our skin, the cable-like support system that is one of the two entities that keep our skin looking fi rm and tight. The other product this factory makes is elastin—another department with a diff erent chemical cascade. The job of elastin is to snap our skin back, like a rubber band, after we move it. Similar to a rubber band, it gets weak and stretched out over time and can sometimes break altogether. At the front door of the factory are three workers, the Amino Acid Brothers—lysine, proline, and glycine. 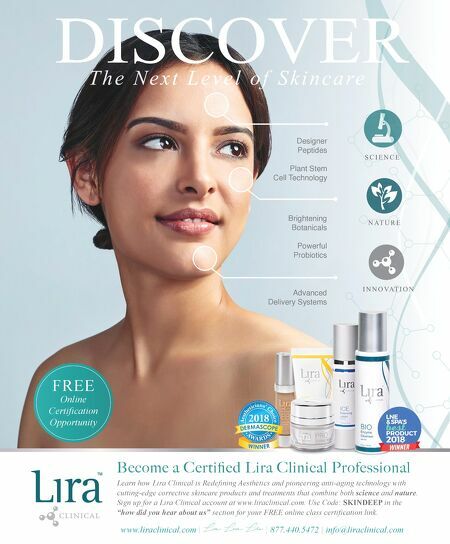 Their primary job, when new collagen is needed up on top near and in the epidermis, is to assemble the constituents needed to create collagen and place them on a conveyor belt (a peptide), which then creates tropocollagen (baby collagen). expertadvice INGREDIENTS Other ingredients are added as the conveyor belt moves through the factory and ultimately comes to the back door where the fi nished, teenaged fi bers are thrust out into the matrix and swim up to where the person's old collagen is getting weak and frayed and breaking down. Locking into place, they bolster up the old collagen, which can then retire into the system, leaving the youngsters behind to support the person's sagging tissue. All of this takes place because the boss of the factory is there orchestrating everything: Mr. Vitamin C. CLEARING THE CONFUSION As discoveries were made about the potential of L-ascorbic acid, a company in Canada developed an entire line around vitamin C, including their trade name, accompanied with an aggressive marketing campaign. As soon as US companies saw the money in this venture, they started making their own versions of vitamin C-infused creams, serums, and lotions. Some claimed to have "discovered" vitamin C; others went with, "our C is special—it's buff ered." Still others touted, "our C is L-ascorbic acid and is nonbuff ered at 25 percent!"